We specialise in Cleaning, Clearing and Unblocking Gutters and offer full gutter cleaning services for residential and commercial guttering. We have a 1 hour emergency blocked drains and gutters response throughout Sussex, Surrey and Kent. Identify Drainage & Plumbing offer high-level gutter cleaning, ensuring all gutters and downpipes are free-flowing and running down the gutter outlets and downpipes as they should be. Gutter cleaning is an essential part of the upkeep of all properties whether they be commercial or domestic. Regular cleaning helps reduce leaks and overflowing gutters that cause thousands of pounds worth of unnecessary damage to your property. This ranges from damp in the walls to extensive brickwork damage amongst other things. Damp is one of the leading causes of property damage, Identify Drainage and Plumbing can prevent this from happening at a fraction of the cost. 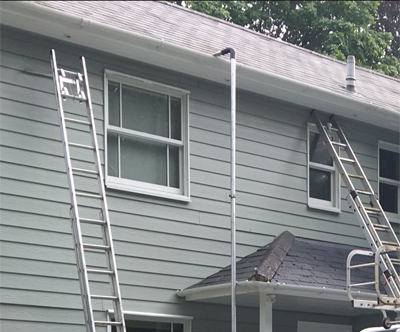 Gutter cleaning can be very dangerous and problematic. Identify Drainage & Plumbing can provide you with peace of mind, with over 25 years experience our specialists pride themselves on their extensive knowledge of all gutter related issues. Our friendly team will be only too happy to help with any concerns you may have. Call us now for advice on 07500 438383 or 01342 810840 . 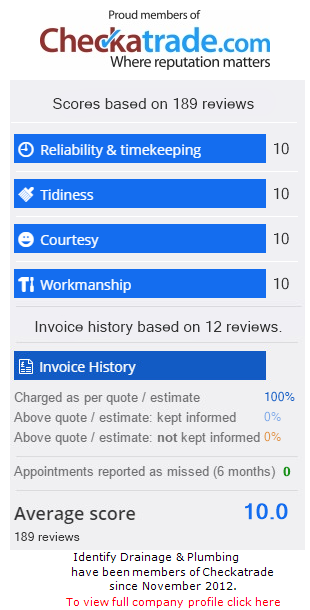 Rest assured we can identify and resolve any problem quickly and efficiently keeping it cost effective. To keep your gutters running effectively, an annual clean is recommended, usually after autumn once all the leaves have fallen. The average gutter gets filled with soil, silt, leaves, moss and other naturally occurring waste products. Neglected guttering can often lead to leaking seals, blocked downpipes and even the collapse of the whole guttering system! Call us now to avoid more expense in the future.